My American family tree is pretty tiny. I am only a third-generation American on my mother's side. My father's side goes back farther, but only about a hundred years or so. I have some neat family stories. I'm just not sharing them right now. This is Stephen Hopkins. He joined the passengers of the Mayflower with his family. My children are related to him as well as his daughter, Constance, who was 14 at the time of her first and only trans-Atlantic crossing. I mention that it was her first crossing because it was her father's third. 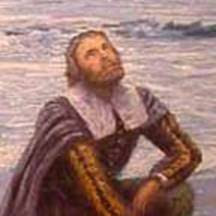 Steven Hopkins originally traveled across the Atlantic to settle in the Jamestown colony. However, that is where the country of Bermuda comes into the story. 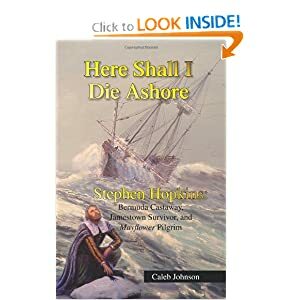 Back in 1609 Steven Hopkins boarded a ship, the Sea Venture, headed for the Jamestown colony and bound to the Virginia Company for a period of time in exchange for his passage and land in the New World. 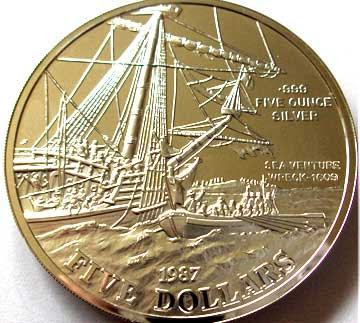 The Sea Venture was one of a group of nine ships that departed in June of 1609. The voyage passed uneventfully until the flotilla was about one week away from their destination. At this time a vicious hurricane struck the group of sailing ships. Eventually all but two of the nine boats reached Jamestown. One of the two boats was lost at sea and the Sea Venture which was shipwrecked. Where was it shipwrecked, you ask? Bermuda, of course. At this time in history Bermuda was uninhabited because it is surrounded by shallow water that made travel to the island extremely difficult in the large sailing ships of the day. Colonizing nations hadn't bothered with Bermuda because it wasn't easily accessed from any point. While this is a good defensive position to have, it is highly inconvenient in all other aspects of colonization (particularly trade). Bermuda was also viewed as a highly supernatural place. For the superstitious sailors living four hundred years ago, that was a deal breaker. They just gave Bermuda a wide berth on their way back and forth across the Atlantic. The former passengers of the Sea Venture had no choice but to make their way ashore on Bermuda. That is where their captain aimed their battered and broken ship. Once there, they found plentiful food, mild weather, and abundant resources. They set to work immediately building two new pinnacles to carry them to Jamestown. Stephen Hopkins was a bit of a revolutionary thinker at this time, but he was able to talk his way out of serious trouble (i.e. a death sentence). The passengers' time in Bermuda was not without perils, souls were lost, hardships abounded, but overall, those Bermuda castaways lived an easy and worry-free existence when compared with the trans-Atlantic crossers from the other ships that actually arrived at their destination. The Jamestown settlers were suffering through the "Starving Time" while the two small ships were being readied and stocked in Bermuda. When the pinnacles Deliverance and Patience arrived in Jamestown in May of 1610, laden with food and supplies they had gathered from Bermuda, their arrival was viewed as a miracle. The souls on board the Sea Venture were thought to have been lost so to have them arrive bearing desperately needed food was a remarkable sight indeed. The experiences of the Sea Venture's crew were sent in reports to England and were distributed widely in London. 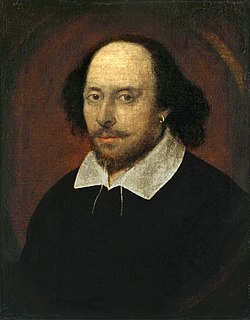 One person who was very interested in the account of the Sea Venture was William Shakespeare who, it is believed, utilized many of these real-life experiences as a foundation for his fictional play The Tempest. 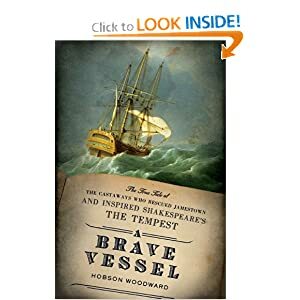 You can read about the whole adventure in Hobson Woodward's book: A Brave Vessel: The true tale of the castaways who rescued Jamestown and inspired Shadespeare's THE TEMPEST. I read this book with my book club. We enjoyed it very much. The best parts are surely the adventurous parts surrounding the hurricane and life in Bermuda! Less than two years after his arrival at Jamestown, Stephen Hopkins returned to England because his wife had died and he was needed to care for his young children. His previous experience in America was most likely the reason he joined (or was recruited to join) the passengers on the Mayflower a few years later. He was not traveling to America with his family to find religious freedom as the Pilgrims were. The knowledge Steven Hopkins gained while in Bermuda and Jamestown was seen as a great asset to a group of religious separatists who had never been outside of Europe. Steven Hopkins saw it as an opportunity for a better life for both himself and his family. With that hope, Steven, his second wife and their family became passengers of the Mayflower. Upon his arrival in Plymouth, Stephen Hopkins was chosen as the first mayor and also an ambassador to Indian relations. One of his house guests you might recall - Squanto. Yes, that Squanto! It is a great read about an interesting, important man in American history! I am so excited that my children are related to him! His life is a great example of perseverance in the face of adversity! I would love it if you became a follower of my blog! 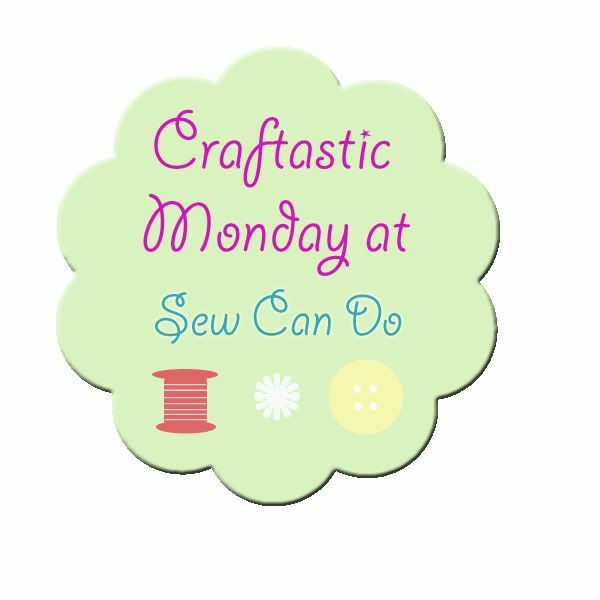 You can also like my page on Facebook HERE or follow me on Pinterest HERE! Remember to add Greetings From the Asylum to your news feed to see all of the updates from the Asylum! 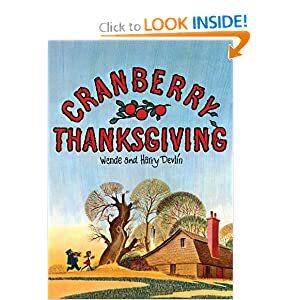 One of my husband's favorite holiday books as a child was Cranberry Thanksgiving by Wende and Henry Devlin. He's been searching for it online since our son was born because it has been out of print for over 15 years. We could buy it, but it was being sold for over $100.00 as a collector's item on Ebay. YIKES! That's a lot of money for a children's book. He has renewed his search time and again until this year when we found it! The Purple House Press is a company that reprints popular classic children's books. Hooray! They have all kinds of fun titles, but Cranberry Thanksgiving is their most recent release. Click HERE to get your own copy! The story revolves around four characters: Grandma, Maggie, Mr. Horace, and Uriah Peabody aka Mr. Whiskers and a sinister plot to steal Grandma's Famous Cranberry Bread recipe. My son was so excited to see the recipe on the back. He wanted to make it right away. That was not possible because I didn't have the ingredients on hand. 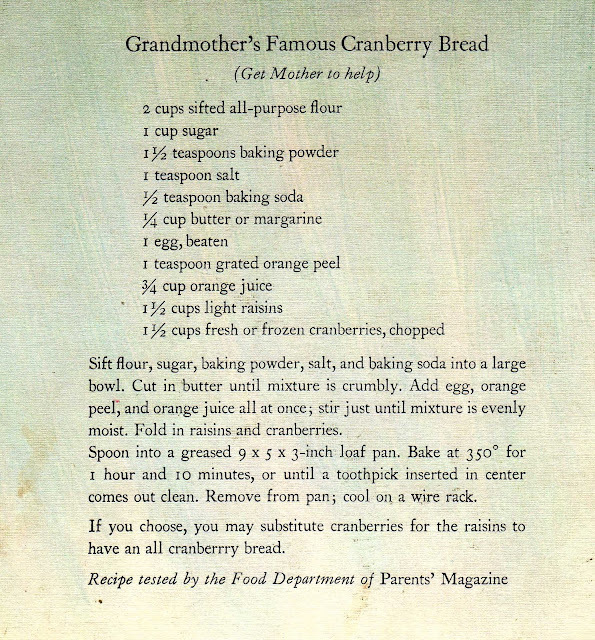 I headed to the store and gathered everything to make my own batch of Grandma's Famous Cranberry Bread! I made this recipe years ago when my husband and I were first married. It was a colossal flop! What I ended up with was a dense brick more suitable for building than eating. YUCK! I have learned a lot about baking since then. I'll show you some of my tricks! First, you need to prep the pans beforehand with cooking spray and parchment paper. The parchment paper is a MUST! This batter is sticky and it will cling to the pan like glue. Line the pan(s) with parchment paper. The cooking spray will glue it to the sides of the pan. Next, Baked goods will become dense if too much flour is put into your batter. The recipe calls for sifted flour. You don't really need to sift your flour. You definitely don't need to look for pre-sifted flour at the grocery store. I NEVER use a measuring cup to measure flour. I only weigh it. That is the most accurate method for measuring flour. A cup of flour weighs 5 ounces. For this recipe we need 2 cups of flour so - 10 ounces. Use a food scale. Mine was about $20.00 and I have been using it for years. My son loves to weigh various things on it. You can also get an ultra fancy one HERE. I would suggest a simpler one more like THIS. Keep your butter COLD before you cut it into the dry ingredients. This will keep the consistency correct. My daughter had a great time helping me with this. Cut the butter into the dry ingredients until the butter is evenly incorporated. I added the orange zest next and whisked it into the dry ingredients. I did this even though the recipe says to add it with the wet ingredients. This was another place in the recipe that I recieved help. I got 1 teaspoon of zest from one medium-sized orange. For the first loaf I used whole cranberries. I added them with the wet ingredients and folded everything together at the same time. I love how bold the red of the cranberries are! PRETTY! I popped a cranberry into my mouth just to try it out. Yikes! That was TART! The recipe calls for the wet ingredients to be added before the cranberries and raisins. The recipe called for "Chopped" cranberries. Finished batter with whole berries. I also didn't add double cranberries. I just didn't think that the bread needed to be stuffed with berries. That is just my opinion though. Scrape the batter into the prepared pans and bake for 70 minutes. I rotated the pans halfway through baking to even the browning. Here is a little side note to entertain you whole your loaves of cranberry bread are baking....The fresh cranberries you buy in the store are harvested first using a rake. The cranberries that are harvested after the bogs are flooded are used for juice and cranberry preserves. Let the loaves cool for 10 minutes before removing them from the pans to continue cooling. Run a butter knife around the ends of the loaf or THIS will happen. The parchment paper will help the loaves to lift out easily. However, the ends will stick even after the cooking spray. You must run a butter knife around the ends to loosen them because they will stick to the pan. I used a butter knife on the loaf on the left and not on the loaf on the right. Notice the stickage! Once the loves are cool you can enjoy your creation! Delicious! The crust of this bread is thick and crispy - not at all like the moist crust of banana bread. (It will soften up after you seal it in an airtight container to keep it fresh.) It is sweet and delicious. Orange is the perfect counterpoint to the tartness of the cranberries. This is definitely a recipe that would become famous. Try it for your Thanksgiving feast! I would love it if you became a follower of Greetings From the Asylum! You can also find me on Pinterest and Facebook. Remember to add my page to your news feed so you get all of the fun updates from the Asylum. Add all of your favorite pages to your newsfeed - you'll see all of the updates you've been missing since Facebook changes its algorithm! Thanks for visiting and enjoy your CRANBERRY BREAD! We have been very busy here at the Asylum lately: cooking, crafting, cleaning... You know, the usual crazy stuff. At the same time I have been helping out a lot at my husband's wildly successful law firm. We have spent many a Friday evening followed by Saturday mornings getting legal stuff done. All that business has kept me away from my blog for too long! I have folders full of photos on my computer that are full of fun projects and adventures to share with you! This pumpkin makes me SOOO happy! Here is a peek at my Thanksgiving decor! You are getting sleeeeeepy............Happy Birthday to my guy! I met Bev from Flamingo Toes!!! HOORAY! I'll tell you all about this in a few days! This little guy lives outside of our office! CUUUUTE! I have so much to say about a plethora of topics. I just have to find the time to sit down and start saying them. I would love it if you would become a follower of this blog. Just click the sidebar! Also, you can follow me HERE on Pinterest, or HERE on Facebook. Make sure you add Greetings From the Asylum to your news feed so you see all of the latest news and updates from the Asylum!